Under Construction presents 322 animated GIFs culled from millions of personal websites once hosted by GeoCities. The 90s web was a rapidly expanding “information superhighway” built by its many new users. 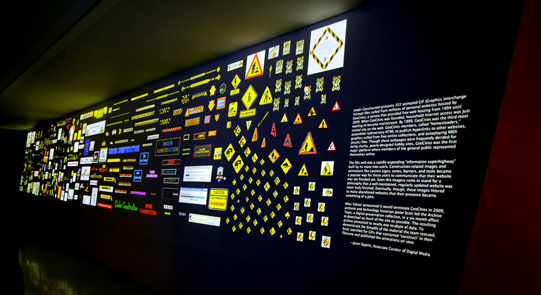 Construction-related images and animations like caution signs, cones, barriers, and tools became a popular way for these users to communicate that their website was not yet finished. Soon this imagery came to stand for a philosophy that a well-maintained, regularly updated website was never truly finished. Eventually, though, these images littered so many abandoned websites that their presence became something of a joke. After Yahoo! announced it would terminate GeoCities in 2009, archivist and technology historian Jason Scott led the Archive Team, a digital preservation collective, in a six-month effort to download as much of the site as possible. The resulting archive amounted to nearly one terabyte of data. To demonstrate the breadth of the material the team rescued, Scott searched for GIFs that contained “construct” in their filename and published the animations in the installation.